Audio and sound equipment is any electrical device used to play, reproduce or record sound, such as turntables, MP3 Players, sound mixers, radios, microphones, speakers, stereo equipment to name a few. This market, which is mostly part of the consumer electronics industry, also includes hi-fi products. Hi-fi stands for “High Fidelity”, a term used to refer to high-quality audio and sound devices, which aims to replicate the original sound as close to reality as possible. Headphones and speakers are two of the most common audio and sound equipments worldwide. Headsets, which include a speaker and a microphone, are commonly used during any digital communication that requires both speaking and listening. Headphones only have a speaker; therefore they are mainly used for listening to audio. The number of headphones/headsets sold worldwide has increased from 236 million in 2013 to an estimate of 334 million in 2016. 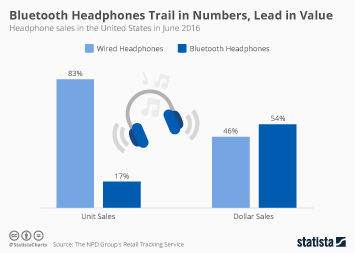 Sales of earphone and headphones for personal use are estimated to generate five billion U.S. dollars in revenue in 2016. Audio speakers are quite popular devices as well. There are several types and styles of speakers – soundbar speakers and bluetooth docking speakers are two examples of them. Soundbars, which are small in size and easy to carry around, have increased in popularity in the last few years, as global unit sales of this type of speaker jumped from 1.3 million in 2010 to about 13 million units in 2015. Global sales of Bluetooth docking speakers have also experienced growth since 2013, going from nine million units sold worldwide to an estimate of 42 million in 2016. The U.S. is a profitable market for the audio and sound equipment industry, as the market value of consumer electronics in the U.S. is estimated to pass the 120 billion U.S. dollars mark for the first time in 2016. Microphones and speaker enclosures are the most popular sound devices amongst American consumers. In 2015, microphones accounted for nearly 36 percent of sound gear retail sales in the U.S. The retail sales value of wireless microphones added up to 144 million U.S. dollars in 2015, while retail sales of cabled microphones were valued at 405 million U.S. dollars in the same year. Speaker enclosures, the second most popular sound device in the country, accounted for around 32 percent of the share in 2015, and had a retail sales value of nearly 490 million U.S. dollars in the same year.